It’s no secret that music has its benefits beyond pleasure. Through contemporary research and practices, music therapy has provided new opportunities for treatment, and many are singing its praises. One group that is doing just that is the phoenix-based Voces Unidas or “United Voices” Choir. The singers in Voces Unidas Choir all have something pretty particular in common: Their lives have all been touched in one way or another by Parkinson’s Disease. People diagnosed with Parkinson’s Disease often find themselves unable to live their lives as easily as they used to, and often need help from family members and caretakers to perform daily tasks and rituals. The disease is also known for the toll it can take on one’s speech. Impaired vocal capabilities, soft speech, voice box spasms and shallow breathing are not uncommon symptoms for people living with Parkinson’s. Voces Unidas mission specifically targets these symptoms using the therapeutic benefits of music, and fostering a community of people all exploring the same situation. The choir works with not just patients of Parkinson’s but also their caretakers and families to promote kinship and improved communication through breathing exercises, stretching and other vocal exercises designed to strengthen speech ability in people suffering from Parkinson’s. The choir’s meetings provide a creative outlet for its participants as well as an opportunity to improve their vocal abilities alongside their loved ones, often set to energizing and upbeat latin rhythms. 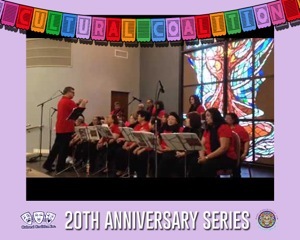 To see Voces Unidas in action, you can hear them perform at our upcoming Dia De Los Muertos PHX Festival on Sunday, October 23rd at 12:30 pm, and get more information on the life-changing effects of these small choir.